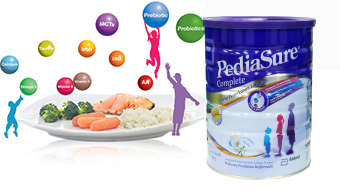 The most improved Pediasure formulation with Sure 3 System. a. New Triple Protein complex blended into an Advance Carbohydrate base designed to help meet your child's growth and developmental needs. b. Scientifically designed Lipid Profile and MCTs (Medium Chain Triglycerides). Now bio-enhanced with vitamins, AA & DHA. c. Complete nutrition to provide the nutritional assurance every mother needs to supplement her child's eating habits. PediaSure Complete® makes for a nutritious, convenient drink between meals. 2 or more servings per day as recommended by your healthcare professional.